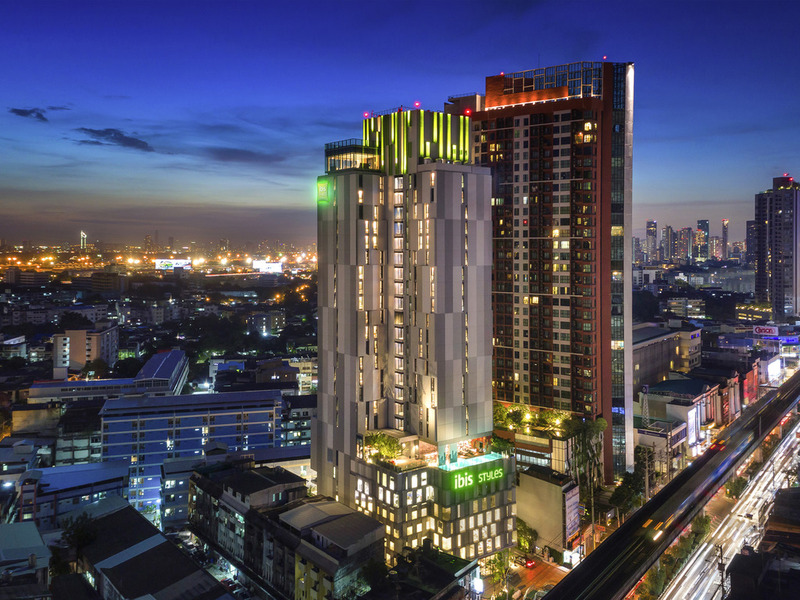 Situated 300m from BTS Phra Khanong station, ibis Styles Bangkok Sukhumvit Phra Khanong is near BITEC Bangkok International Trade and Exhibition Centre, Jim Thompson factory outlet, community mall and the shopping district. The hotel offers 255 standard 23 m² rooms. Connecting rooms are available for families. Rates include WIFI. Facilities include a kids' club, restaurant, swimming pool, pool bar, fitness center and 2 meeting rooms. Perfect for leisure and business travelers. Bangkok is the capital of Thailand. It is well known for its shrines and vibrant street life. Located on level 7, Streats Café is a dining venue serving delicious daily buffets featuring local and international cuisine for breakfast and lunch. An a la carte menu is available for dinner. Diners can enjoy free WiFi and wonderful city views. Located on level 7, the alfresco Streats Bar offers a menu of tasty light meals, cocktails, coffees and teas. There is a daily Happy Hour from 4pm to 6 pm. Diners can enjoy free WiFi and wonderful city views. We had a great time thanks to Ibis Styles Bangkok Sukhumvit Phra Khanong. The location is quite good and the rooms are good quality. It was a nice and quiet hotel. I had a good rest and the staff are friendly and accommodating to our needs. They provided us with good traffic advices. Staff are very kind and helpful. They always smile and greet. :) BTS Phra Khanong station is only 7-10min walk (with kid). Hotel offer shuttle to station so that was a plus ;) Breakfast was good. Mainly Asian breakfast but it’s good for me since I am asian. Facilities were clean. Bed is really comfy. There are convenient store nearby. Highly recommended. Nice hotel and nice staffs. Reception really nice Room keeper also. Door men very polite. My stay is good as always. The staff is nice. I have a corner room. The room is Good and functional. The breakfast is simple. But the coffee is not good. Anyway, I recommend this hotel for the price and location. Good location, clean hotel but we were told the breakfast was not included in the price. Ibis Style signature is the Breakfast and Wifi including for all the guest but things seem to have changed without notice. And in &quot;Catering&quot;, it is noted &quot;Breakfast included in the price&quot; on the page of the hotel on Accorhotels.com (still shown today despite our claim). The manager on duty at the reception kindly gave us a free breakfast as a compensation though, but it would be honest from you to amend the data about your Ibis Style hotels and to inform the customers. Ok, so we had the poorest breakfast ever there - plain unsalted rice, no curry to go with, just a pork stew, a few sausages, eggs, dry dry hard bacon. The croissants were not edible, certainly unfrozen from 2 days before, but a lottttttttt of pancakes were available... No great choice anyway, no chocolate powder for the milk, nothing, nothing, nothing. By far our worst breakfast experience ever. Anyway, this is the problem of Accor (and AccorPlus): reducing the offer from year to year, slowly downgrading it to make more profit but we customers are not stupid and have plenty of other choices. Sadly, you have a very bad insight of the business now. Good experience. Small but nice rooms, great shower. We mostly sleep at the hotel and was out in the city all day and for that the hotel is perfect. Good location close to metro and not that far from the airport. Some loungechairs at the pool would be nice. Many rooms are facing the extremely loud street. The construction work next to the hotel - jackhammer from 11 pm till 3am(!) makes it impossible to sleep). Windows are not soundproof at all - leaving them open wouldn‘t change anything. Room service uses walkie talkies in the morning right in front of my room which is an avoidable noise. Seems to be a hotel with mainly Chinese guests. Those next to my room were super loud, no matter, what time it was. Hardly anyone of the staff speaks English. Super slow and bad service in the restaurant. We ordered 9 dishes in the evening, 3 never arrived at the table. No apologies were given after we made the staff aware of that. We had to order one of the dishes 3 times, it took more than 90 minutes till it finally arrived. Rooms are clean, room service is doing a great job. The bed is very comfortable! Some might find the room to be too small, I think the size was absolutely okay. Breakfast is boring. Hardly any fresh fruit, the jam must be the cheapest one that the hotel could find. No fresh juice, yoghurt or good cereals. Every morning I had to ask for a knife or a spoon. No one understands you there. I‘d recommend the staff to learn basic vocabulary when working in a restaurant. Staff is not attentive at all. 8 out of 10 times we had to stand up and look for them to order. Most only stand around. I was pleased ultimately due to your amazing staff. Very pleasant and helpful. Room was comfortable though I found the bed slightly odd as it slanted downwards. WiFi was good. Breakfast was fine though would have preferred better quality jam and marmalade, also some more meats such as bacon would've been nice. Overall, a nice hotel and I'd stay again.